Join the IPCC in the wildlife gardens of the Bog of Allen Nature Centre this Friday 5th June from 10am-4pm and celebrate World Environment Day. All are welcome to attend this event and visitors can expect to explore and discover some of the ways each of us can support a healthy environment in our own gardens. This event is part of Feile an Dúlra – an annual festival of nature organised by the Irish Peatland Conservation Council (IPCC) at the Bog of Allen Nature Centre and supported by Kildare County Council through the festival grant scheme 2015. The 2015 theme of World Environment Day is ‘Seven Billion Dreams. One Planet. Consume with Care’. 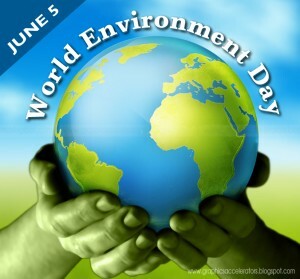 It is a day promoted by the United Nations and aims to raise awareness that by 2050, if current consumption and production patterns remain the same and with a rising population expected to reach 9.6 billion, we will need three planets to sustain our ways of living and consumption. A healthy environment is essential for all life, without freshwater plants and animals will not survive, a healthy soil is essential for growing foods while thriving biodiversity populations will regulate pests and support strong harvests. The wildlife gardens at the Bog of Allen Nature Centre are an ideal location to celebrate our local environment on World Environment Day. They are peat free and demonstrate how all plants from vegetables to flowers can grow and thrive in compost produced in your own garden. Choosing peat free will not only help to protect a sample of the wet and wild peatlands of Ireland but also reduce waste going to landfill site. Organic waste in landfill sites produce smells and can leach nutrients into water supplies. Composting organic waste such as grass, dead flowers and fruit and vegetable peelings is a great way to make a healthy soil for your own garden. With advancing technology and mains water made available in every home our water consumption demands have steadily increased through the years. Freshwater is precious for all life however to make it available to all it costs money. Plants growing in our gardens do not require treated water and setting up a system in your garden to harvest rain water will help to conserve this essential ingredient for life. Editors Notes: The Irish Peatland Conservation Council is a charity that aims to protect a sample of Irish peatlands for future generations to enjoy. They are based at the Bog of Allen Nature Centre a centre of excellence in peatland education, conservation and research. This entry was posted in News and tagged Activities, Attraction, Bog of Allen Nature Centre, Conservation, Event, Events, exhibitions, experience, Family Nature Activities, Festival of Nature, IPCC, Places to Go. Bookmark the permalink.